Fuel gas heating is used for several applications. Besides fuel gas heating to increase gas turbine performance, many of the applications are related to the dew point of the gas. For these applications Eltacon Engineering uses several techniques, like shell and tube heating or electrical heating, based upon the available utilities at site and feasibility. In order to guarantee the fuel gas used for gas turbines and gas engines is dry for combustion, a heater can be used to superheat the gas to a required temperature above the dew point of the gas (water- and hydrocarbon dew points considered). This can be by a positive differential temperature or a pre-set fuel gas outlet temperature. 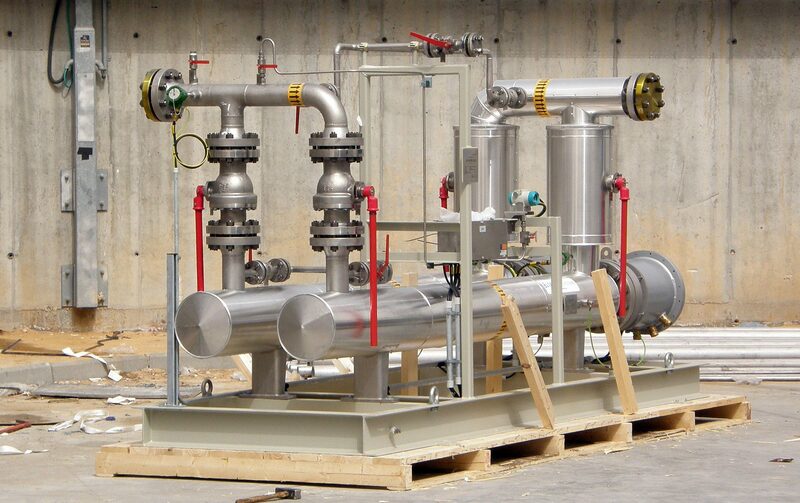 A common set-up for a gas treatment unit is a combination of a coalescer filter system with downstream superheating. Using pressure reduction stations in fuel gas treatment runs will cause the fuel gas to cool down due to the Joule-Thomson effect. Depending on the dew point of the gas, re-heating of the gas might be necessary to avoid condensation downstream the reduction section. The heater can be set to maintain the inlet temperature of the system, or the heater can be used as a dew point heater with a pre-set fuel gas outlet temperature. One technique utilized to enhance combined cycle power plant performance is to heat the gas turbine fuel gas. Heat is extracted mostly using the cooling water of the gas turbine and is used to raise the temperature of the fuel yielding an improvement in net plant performance rate. The availability of the heater and performance will depend on the available utility and is therefore not to be used as dew point or start-up heater. Eltacon Engineering B.V. uses electrical heat bundles to superheat the gas. These bundles are powered by a Thyristor Control Unit, included in the delivery. Shell and tube heaters are mainly used for performance heating. The fuel gas will be heated using hot water, steam or oil depending on the available utilities. Outlet temperature control is included in the unit control panel or can be integrated in the DCS. In order to avoid the necessary additional safety equipment (auxiliary equipment to safeguard pressure leakage), a safety heat exchanger can be installed using double tube technology.